Living internationally for the majority of my childhood instilled a thirst for exploring the world. 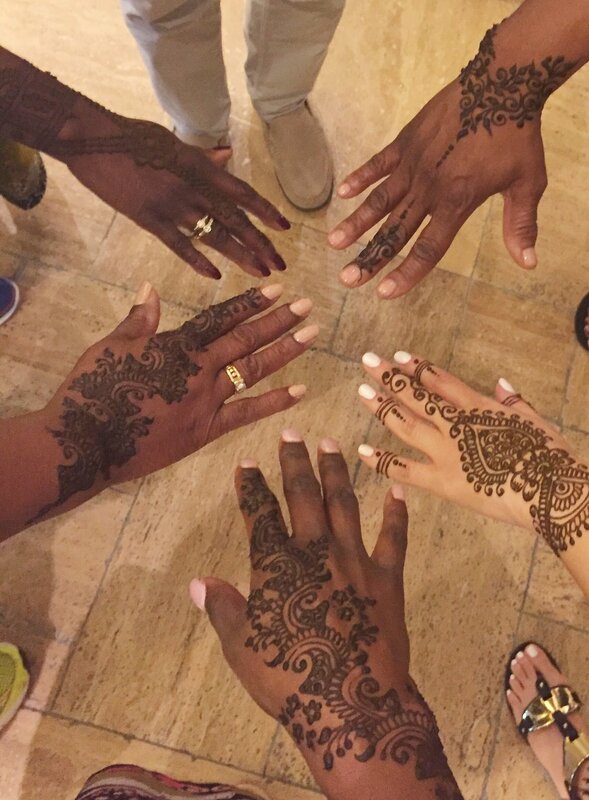 I recently was blessed with the opportunity to quench an ultimate cultural thirst by visiting the dazzling Dubai and Abu Dhabi with longtime friend Sheila known to the crew as Sheila E. When we first booked the trip my first thought was, it will be a hot desert with many locals in traditional garb with some English here and there. Well to my surprise I was shocked but in a good way. It was not at all what I was expecting......Dubai is LIT!!! Getting there was half the fun. The 15 hour overnight flight on Qatar Airways from NYC gave a sense that this trip was going to be one for the record books. Each seat was provided with an in-flight goodie bag of essentials, a television with the latest movies and documentaries for our viewing pleasure, and some of the tastiest plane food EVER....talk about yummy!. I can definitely understand why Qatar Airways was named one of the "World's Best Airlines" in 2015 by Skytrax. Courtesy and hospitality are important virtues in the Arab world. The friendliness and warm pre welcome provided was the perfect cultural introduction. Day 1 we arrived in Dubai around 1pm and was greeted by our amazing tour guide Abdul. We had the remainder of the day at our leisure but Abdul was kind enough to offer us a mini tour of the modern Dubai. He showed us how to ride the metro along with metro etiquette. We strolled through the Dubai mall which is one of the biggest in the world. We stopped for henna tattoos and ended the night with a water fountain show in front the tallest building in the world, the Burj Khalifa. The first day was a wonderful and FREE experience and next time I plan on treating myself to reservations at one of the restaurants along the fountain to get the full experience. Dubai has pretty much gone from dirt roads to a large metropolis in about 12 years and keeps growing and growing; there are cranes everywhere you look. Many people think it's all from oil money but Dubai really does not have that much money from oil. The government has build their infrastructure through business trade and tourists. Many worldwide companies have set up offices in Dubai and encourage people from around the world to work abroad in Dubai. Hey, if Trump becomes president I will immediately apply for teaching positions available and will be on the next plane to the United Emirates! Day 2 we met Abdul to embark on a short city tour of the historic sites and vibrant cosmopolitan life of Dubai. Our first stop was the famous landmarks Jumeirah Mosque and the beautiful sail-shaped Burj Al Arab hotel. 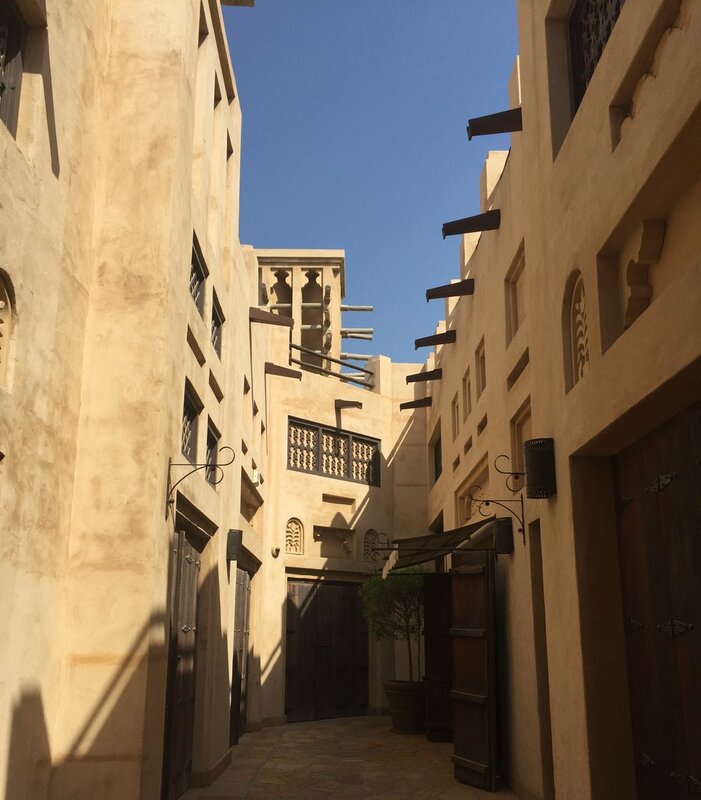 We also ventured into Al Bastakiya, Dubai's inspiring old quarter for a quickie lunch break at the charming XVA Cafe. The cafe is a interesting establishment located in a courtyard. It used to be the home of a super wealthy family that is now a cafe, hotel, and art gallery. Our guide Abdul explaining the history of the Arbain traditional style of dress in the gorgeous courtyard. Then we took a water taxi called abra to one of the largest street shopping areas in Dubai. The taxi or old wooden boat that looked like it maybe should have been retired a while ago took us across the Dubai Creek to the glistening gold and spice souk. Day 3 our journey started at the world's tallest building the Burj Khalifa. It's a 830m-tall tower connected and situated above the Dubai mall, dominating the skyscraper-filled skyline. It makes total sense that Dubai would be home to the world's tallest building. Only in Dubai- that's something you will find yourself constantly saying and that is not a bad thing. That's just the attitude there, bigger and better! 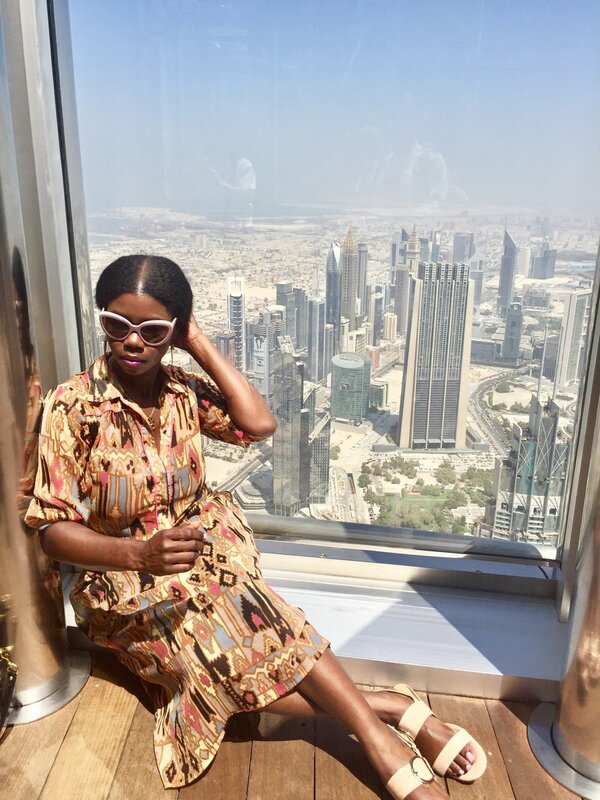 Making a quick trip to the observation deck on the Burj Khalifa provided amazing views of Dubai and the surrounding area. The Burj Khalifa almost looks unreal and the views show how much construction has already taken place and how much room there is for growth. The heat x 10,000000 in Dubai officially knocked me down for the 1, 2, 3 count and this was the only way I could take a pic at that point. 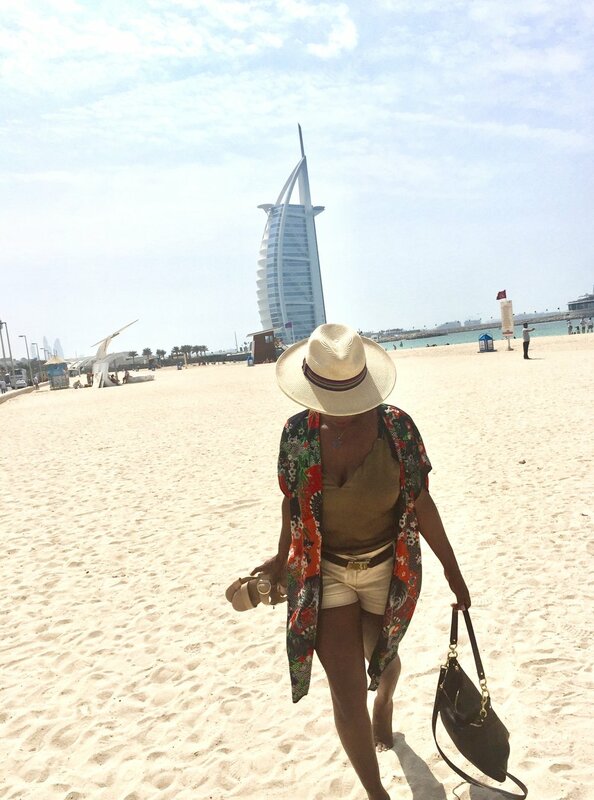 We also journeyed to the Dubai Marina and the Palm Jumeirah with the famous resort Atlantis. The Atlantis in Dubai is a manmade island that has become a potent symbol of the Emirates, housing some of the most expensive real estate in the world. Honestly, by the time we arrive my jack lag had taken over and I decided to stay on the bus to catch some zzzz.......pimp down, lol! My apologies for no pics but Sheila and I went out the night before to engage in the nightlife and I forgot I'm not in my early 20's and my body needs REST nowadays! Our last stop ended at the Souk Madinat Jumeirah. A colorful and vibrant market with winding passageways that lead you through a real Arabic bazaar. The bazaar gave me the ambience of higher end boutiques, with local artisans and beautiful views towards the canals of the Madinat Jumeirah resort and stunning vista of the Burj Al Arab. To say our days were jammed packed is understatement. By day 4 my body was like what in the world are you doing to us. I was beyond exhausted and needed a leisure morning at my new favorite spot, Jumeirah Beach! Even though Dubai is quite westernized, my spirit was longing to engage in a traditional virtue of the Arab world. After a much needed morning relaxing on the beach, I was looking forward to my favorite part of the trip.......the desert safari bbq in the middle of the sand dunes. Around 4pm we meet our safari guide who droves us through the dunes leaving behind the hustle and bustle of the city. Friendly FYI, make sure you have a strong stomach before embarking because riding through the hills and valley of the sand will cause last night's dinner to make a special appearance. Just when I felt like I was about to hurl, we stopped at the crest of the high dune to watch the amazing sunset. To see the sun casting its orange glow over the vast expanse of the rippling sand was sheer perfection. After our mini photo shoot, we hopped back into our ride and headed towards a shimmering mirage in the distance with flickering lights where the camp of a traditional Arabian welcome awaited us. Peace signs with the ride or die Sheila E.
The open Bedu tent camp conjured in my mind images of the Arabian nights and the seating was the traditional low cushions in the warm desert sand. A feast of grilled meats, fresh salads and delectable Arab sweets was served under a galaxy of stars while we were entertained by the bewitching belly dancer swaying to the melodic sounds of Arabian music. Day 5 at the crack of dawn we caught an early morning bus for a 2 hour trek to the capital of the United Arab Emirates and the residence of the Federal National Council (one of the world’s largest producers of oil) Abu Dhabi! First stop was the Sheikh Zayed Mosque, specially designed by late Sheikh Zayed Ben Sultan al Nahyan. He wanted the mosque to be visible from all directions so he had it built with the rise of 11 meters above sea level and 9.5 meters above street level. All in all, it took almost 12 years and more than 38 contracting companies and 3,500 workers to build this beauty. WOW! It was built as a reminder of the past for the younger generation. Walking up to the majestic Grand Mosque, I was mesmerized by oplenance of the all-white marble temple. Once inside, you’ll see the massive courtyard that has 1,048 columns that are adorned with exquisite hand painted flowers. And when you look down on the floor, you’ll see this huge floral artwork sprawled all over the courtyard. The entire structure is marble and for a minute, I felt like a queen in my own little palace! Prior to our tour, it was stressed beforehand we must adhere to the Grand Mosque’s strict dress code- Men have to wear long trousers and no sleeveless shirts, women have to cover their arms from the wrists with a long-sleeved shirt, cover their hair, décolleté and neck with a headscarf and long trousers covering their ankles, and NO tight clothing! The mosque is large enough to accommodate over 40,000 worshipers. The main prayer hall can accommodate over 7,000 worshipers. There are two smaller prayer halls, with a 1,500-capacity each, one of which is the female prayer hall! Featured on the Qibla wall is the name of all 99 names of God (Allah) in traditional Kufic calligraphy, designed by the prominent UAE calligrapher, Mohammed Mandi Al Tamimi. The main prayer hall houses the world’s largest hand-knotted carpet. The intricate Islamic medallion design was made by third generation carpet maker and artist, Dr. Ali Khaliqi. The predominantly wool carpet was hand-crafted by approximately 1,200 artisans. Its creation was a two year project, the design took approximately 8 months, the knotting 12 months and the remaining time to transport, trim and weave the pieces together. The final single piece carpet is 5,700 square meters, about 70% being wool and the rest of 30% is cotton. This is one of the grandest chandeliers I’ve ever seen. Sheikh Zayed Grand Mosque actually has seven crystal chandeliers studded with Swarovski Crystals situated inside its halls and foyers, all of which were made and shipped from Germany by Faustig. This one is the largest and weighs approximately 12 tons! The entire place is a work of art which is why I count this as the highlight of my day tour in Abu Dhabi and one the greatest experiences to date. This one of the four blue coloured chandeliers of similar design and size located in the foyer of the entrances. Below located on the shores of the Arabian Gulf, overlooking its own private natural bay, is the the entry and back of the Emirates Palace. I think the best way to describe Dubai as an international Las Vegas. It's a huge melting pot of people and culture and there is no shortage of glitz and glamor but with the heat index of 1 trillion. Only 20% of the population is native citizens, where the rest are from other countries from around the world. Many people living in Dubai are from India, the UK and even the US. It is hard to tell that you are in a country halfway around the world when English is the common language. It's hard to explain the energy and how unreal everything is there. This was an amazing trip and I feel so blessed to check mark Dubai and Abu Dhabi off the bucket list. I'm looking forward to returning to my new adoptive home soon. Please make plans to visit because the world awaits you in the United Arab Emirates! !